Welcome to the SDDC Series, focused on announcements made at VMworld 2014 US. You can click me to return to the directory, or choose posts from the menu on the right. Custom Builds – These are the traditional, build-your-own style data centers, in which engineers or architects in the organization take the silo components – network, storage, compute, and management – and cobble them together using a combination of experience and know-how. Converged Infrastructure – Offerings that combine the components from Custom Builds into an offering, either as a product (such as Vblock) or as a reference architecture (such as FlexPod). The benefit is that most of the architecture challenges have been solved for the consumer, and in the case of Vblock, is offered directly from the factory as a set of cabinets fully racked and stacked. 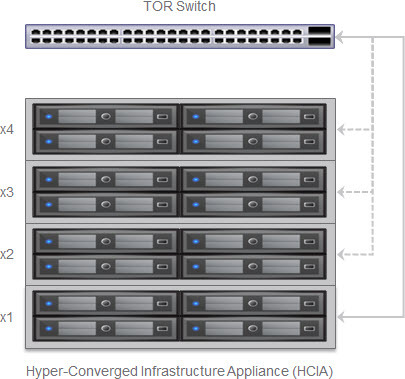 Hyper-Converged Infrastructure – This is usually a clean-slate approach that uses COTS (commodity, off the shelf) components to build a node that contains the compute power, storage, and upstream network interfaces. Nodes are pieced together into a seamless fabric using dedicated or shared network interfaces, varying from InfiniBand to traditional Ethernet, to look and feel like a single, logical entity. There is still a need to plumb these nodes into the physical or underlay network, typically a top of rack (ToR) or end of row (EoR) grid that connects up into a leaf-spine or three-tier topology. Eenie meenie miney mo, catch a data center by it’s toe. EVO looks to play in that third space, the Hyper-Converged Infrastructure offering, which eliminates a vast amount of architecture decisions around how to build a pool of resources for applications to consume. Incumbents in this space include Nutanix’s Virtual Computing Platform and SimpliVity’s OmniCube. By the way, both companies I just mentioned have been presenters at Tech Field Day’s in the past. Each HCIA (again, that’s the Hyper-Converged Infrastructure Appliance for those playing at home) is a 2U chassis with 4 nodes inside. The version 1.0 release will allow for 4 HCIAs to be put together, resulting in 8 RU of rack space and 16 nodes worth of EVO. That’s half the size allowed by the vSphere 5.5 cluster maximum, so I would imagine that the number will grow at some point beyond the 1.0 release. At least, let’s hope so. If you’re curious what VMware is targeting for EVO, it boils down to just about everything. Here’s a slide that could have easily been renamed to “all your base are belong to us” and not been far off the mark. All your data center are belong to us. I did notice that business critical applications, which are typically big SQL / Oracle / SAP / BI and so on, are missing from the list. 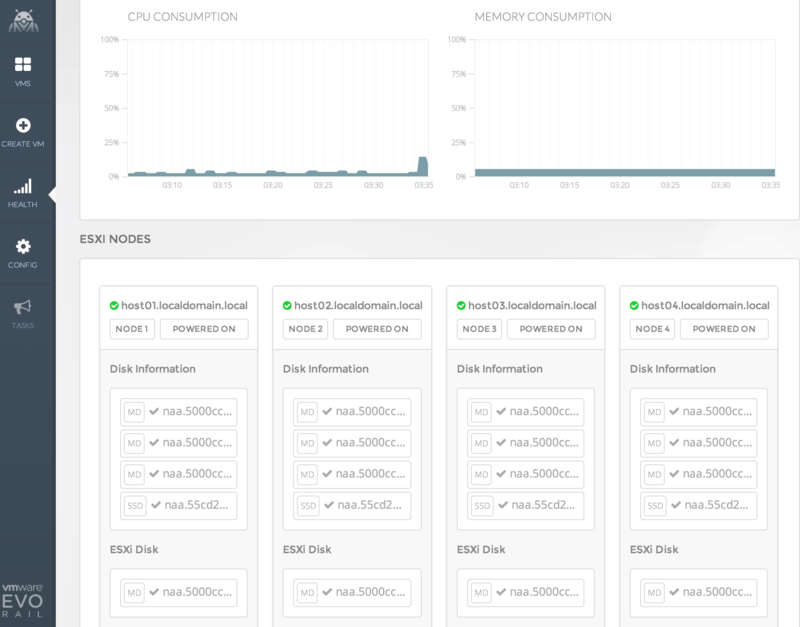 This is an area that Nutanix often touts as an advantage with their 8000 series nodes. I’d say there’s still a gap here, but one that may not make a huge difference from day one for most customers depending on their targeted deployment strategy and road map. Just Go! 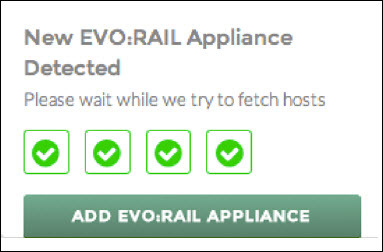 – With Just Go!, EVO: RAIL automatically configures the IP addresses and hostnames that you specified when you ordered EVO: RAIL. Configure your TOR switch and click the Just Go! button. All you have to create are two passwords. Customize Me! 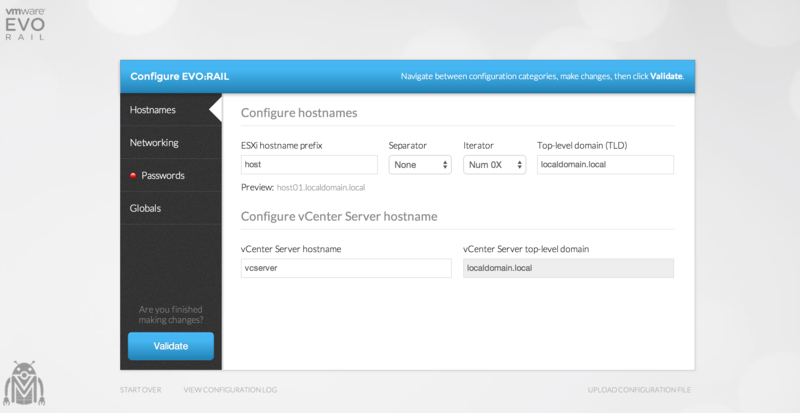 – When you customize EVO: RAIL, all required configuration parameters are supplied for you by default, except for ESXi and vCenter Server passwords. Customize Me! allows you to easily change the defaults. Upload Configuration File – With Upload Configuration File, an existing json configuration file can be selected and uploaded. The wizard asks questions about the host names, networking configuration (VLANs and IPs, etc. ), what passwords to use, and other things that I’m sure you can imagine being required. In fact, here’s a screenshot of the wizard or you can watch one of several videos that VMware has cooked up. After completing the wizard, you get a snazzy little build process indicator that shows a high level workflow around what the engine is doing. Building your SDDC, including vCenter, with a friendly wizard. Once completed, you get a very happy completion screen that lets you log into EVO:RAIL’s management interface. Once logged in, you are presented with a dashboard that contains data on the virtual machines, health of the system, configuration items, various tasks, and the ability to build more virtual machines. 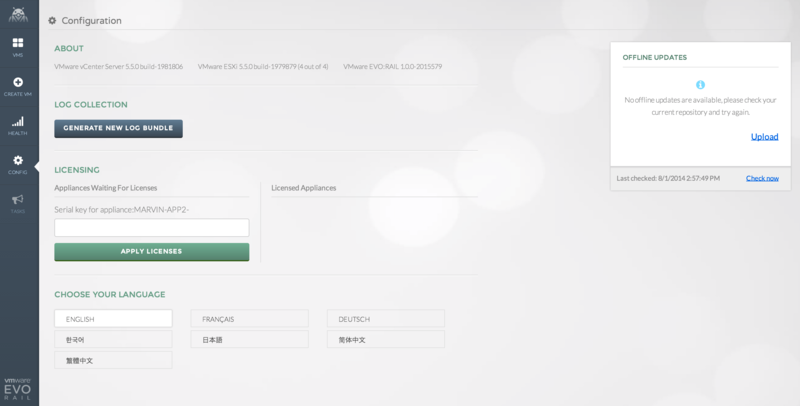 Notice that the configuration screen also includes build versions of vCenter, ESXi, and EVO:RAIL, along with the ability to license the product and push offline updates (important for those without an interface facing connection) to the EVO. 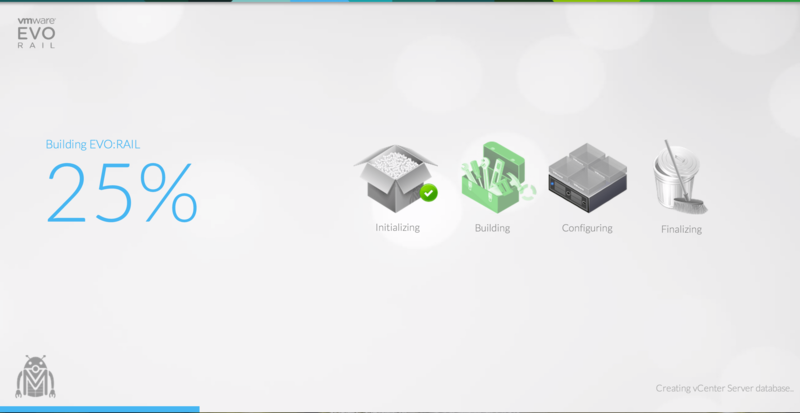 Building virtual machines is also done through EVO’s interface, with more friendly graphics to walk you through the process. Folks worried about day-to-day operations of the EVO:RAIL can use the Health tab to see how all of the nodes within the HCIAs are doing. 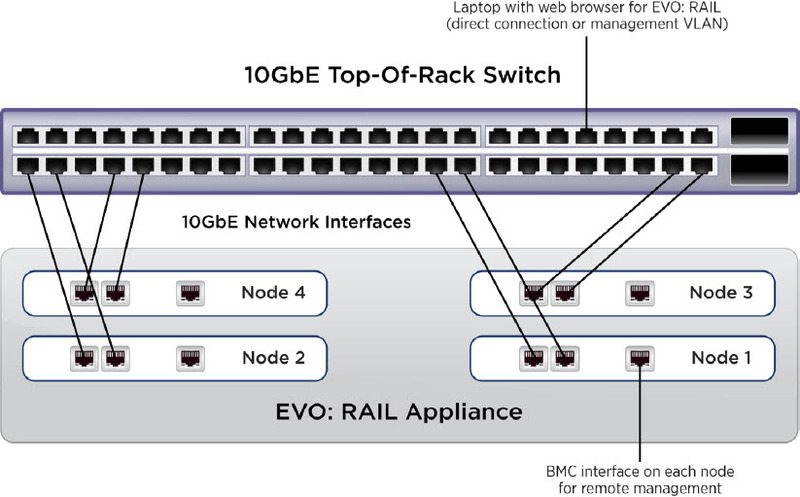 Adding a new HCIA involves cabling the appliance and then letting EVO:RAIL detect and connect. The rest is handled for you. You can only add one appliance at a time in release version 1.0. Green checkmarks are good, right? Configure a management VLAN on your TOR switch(es) and set it to allow multicast traffic to pass through. Enable IGMP Snooping on your TOR switch(es) AND enable IGMP Querier. By default, most switches enable IGMP Snooping, but disable IGMP Querier. Disable IGMP Snooping on your TOR switch(es). This option may lead to additional multicast traffic on your network. I would assume most folks would actually use two ToR switches for redundancy. I’m quite impressed with the interface for EVO for a number of reasons. It uses HTML5, is very simple and friendly to use, and offers a number of ways to stand up through either pre-determined configs or user-driven answers. It will be very interesting to see how the pricing stacks up against other converged or hyper-converged solutions, and which use cases end up shining strong for customers that are looking to simplify their IT infrastructure. great post (as always) summarizing the new offering!! !